Not too far from my home is an excellent Thai restaurant called Dok Bua. It's in a space that was originally a grocery store, and the glass-door refrigerators still line the restaurant's side wall, though in the last couple of years they have put pretty silkscreened images in the doors to conceal the restaurant's supplies stored within. The decor is random, eclectic, and beyond kitsch - garish plastic light-up palm trees stand side-by-side with Buddhust iconography and glowing neon clocks and strings of Christmas lights. One of the fun features of Dok Bua is the menu - there is an ordinary laminated menu that lists all the available dishes segregated by type in the usual way, but when you are shown to your table you are also handed a photo album whose pages feature the restaurant's staple dishes and specialties. You can flip through the photo album and just choose what looks good. 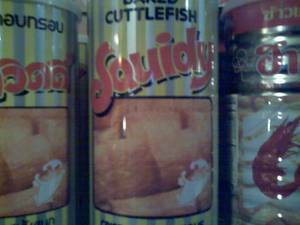 There were several brands of these dried cuttlefish snacks, but "Squidy" was my favoite. It may be difficult to see the "Squidy" mascot at the lower right of the can. My last purchase at the Dok Bua grocery counter was a package of addictively good, tangy little tamarind candies. This link shows a similar candy, though not the exact brand. I really didn't need to know how good these candies were. Oh how I miss it! We ate at Dok Bua the first night we lived in Brookline. During Passover they knew that we didn't want rice with our meal. Such tasty food and such a unique spot. Being far from Thailand (my homecountry), I miss Thai food soooooooo much.